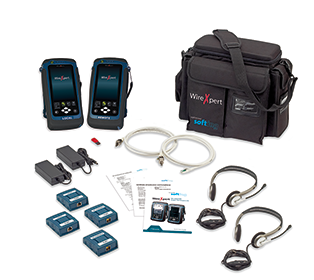 WireXpert 500 is an affordable and upgradable cable certification tester that can grow with your cable certification needs. Invest today only in options that are really needed and upgrade the device later when necessary. Options are available for just copper cable certification up to CAT 6A/Class EA, a fiber optic multi-mode and single-mode tier 1 certification tester and a combined copper and fiber certification tester. The individual options can be upgraded with a license. For example: If today you install copper and in the future require additional fiber cabling installations, you could then upgrade your WireXpert 500 copper certifier to a WireXpert 500-PLUS, a copper and fiber certifier. If you need in the future certification up to CAT 8, all models can be upgraded to that frequency range as well.